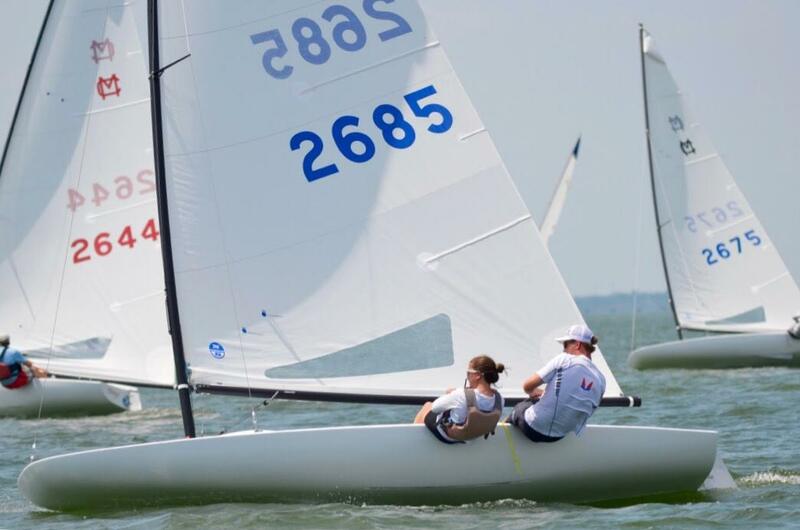 Rush Creek Yacht Club, Texas (June 17, 2017) – Eddie and Kate Cox took the MC National Championship title in a brand new Melges MC Scow powered by North Sails’ Z Max design. It is the first MC Nationals win for the sibling duo from White Bear Yacht Club. Cox won three out of seven races. The title came down to the final race. Leading up to the final day’s one scheduled race, Cox was close at the heels of regatta leader Mark Tesar. It was Cox vs Tesar in the final shootout. Cox set up on the starting line immediately to leeward of Tesar. Cox’s boat speed put his bow out, and just after the cannon the race was his to control. At the first windward mark he had a 30 second lead ahead of Kenny Wolfe and Virginia Hannen, the second place boat. Tesar was 18 boats back. Cox led the race wire to wire, holding off Wolfe and Tesar. Tesar climbed back on the last beat and finished with a 13th place, the deepest finish in a very strong, consistent regatta for the MC veteran. The day started with winds blowing 20 to 26 mph. A very patient Principle Race Officer Chip Mann and the race committee team held the fleet onshore until the breeze came down to 15 to 20 mph. It was fun sailing all regatta long with fair racing in moderate to heavy winds on Lake Ray Hubbard. Rush Creek Yacht Club proved to be a great venue for the championship, bringing masses of volunteers, strong leadership, and an excellent racetrack. North Sails finished first and second. Andrew Vandling won the Youth Division. Katie Arvesen took the Women’s Division. In the Grand Master’s Division, Greg Gust edged out Eric Hood and Kelson Elam. Mark Tesar won the Master’s Division followed by Bill Draheim and Ron Baerwitz. Mike Keenan took the Mega Master’s Division. In the Singlehanded Division, Mark Tesar beat out former US Sailing Team member Andrew Casey and Ivan Lopatin. Races were won by Eddie Cox, Mark Tesar, Bill Draheim, Will Crary, and Ivan Lopatin. The next three major-scale events for the fleet are the Masters Nationals, the Inland Lake Yachting Association Championship and the Western Michigan Championship.